CREATE VIEW statement called SCHEMA BINDING tells SQL Server to check for dependencies and disallow any modifications that would violate them 8. CREATE VIEW myView WITH SCHEMABINDING... 11/04/2013�� Insert the data into a temp table which you have created with generic column names, and then use sp_rename to change then names of the columns. Don't get lost in dynamic SQL. Don't get lost in dynamic SQL. If you change the name of an object referenced by a view, you must modify the view so that its text reflects the new name. 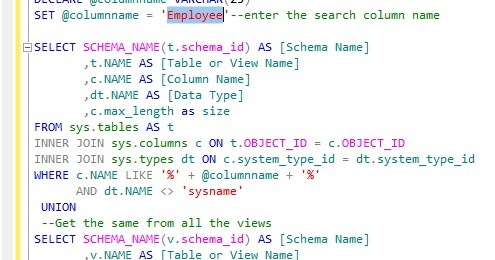 Therefore, before renaming an object, display the dependencies of the object first to determine if any views are affected by the proposed change.... 11/04/2013�� Insert the data into a temp table which you have created with generic column names, and then use sp_rename to change then names of the columns. Don't get lost in dynamic SQL. Don't get lost in dynamic SQL. CREATE VIEW statement called SCHEMA BINDING tells SQL Server to check for dependencies and disallow any modifications that would violate them 8. CREATE VIEW myView WITH SCHEMABINDING how to create a company structure A column name is required only when a column is derived from an arithmetic expression, a function, or a constant; when two or more columns may otherwise have the same name, typically because of a join; or when a column in a view is specified a name different from that of the column from which it is derived. Column names can also be assigned in the SELECT statement. Click "SQL Server" to view a list of programs for the database. Click "SQL Server Management Studio" to open the console. Click "SQL Server Management Studio" to open the console. Click the database name on the left side of the window. 30/04/2011�� CREATE VIEW employee_view ( first_name, last_name ) AS SELECT first, last FROM employee; You cannot however, rename a column in a view. You would have to DROP and CREATE or CREATE OR REPLACE. Warnings. Returning all column names on a very large database with many objects may provide too much information to be useful. Consider narrowing your scope of inquiry with a series of search filters in your SQL "where" clause. I'm attempting to select the column names of a view in a similar way as selecting from information_schema.columns. I can't seem to find a way to do this. Has anyone else done this before or know I can't seem to find a way to do this.